Introducing Illumibowl, the world’s first Motion-Activated Toilet Night Light (As seen on Shark Tank) Enjoy the convenience of finding your way to the toilet bowl in the middle of the night without having to turn on the bright overhead bathroom lights. Illumibowl will illuminate the inner bowl of the toilet and provide a soft glow any time you walk into your bathroom in the dark. Featuring a motion sensor and built-in light detector, the Illumibowl will turn itself on and off. This innovative toilet night light only works in the dark; once movement is detected, the soft light will turn on for 2 minutes. If the room lights are on, it will stay off allowing for efficient battery use. Choose between 9 different color settings. Set to your favorite color (8 single colors) or color-cycle with the touch of a button. The brightness can also be adjusted using the 3-stage dimmer. The modern strong hold design of the Illumibowl allows you to custom fit the flexible never-fall arm to any toilet. No need for tools or adapters, just hook over the rim of the toilet bowl and you are all set! The light is battery-powered with 3 AAA batteries (not included.) Removal for cleaning is also simple and hassle-free. 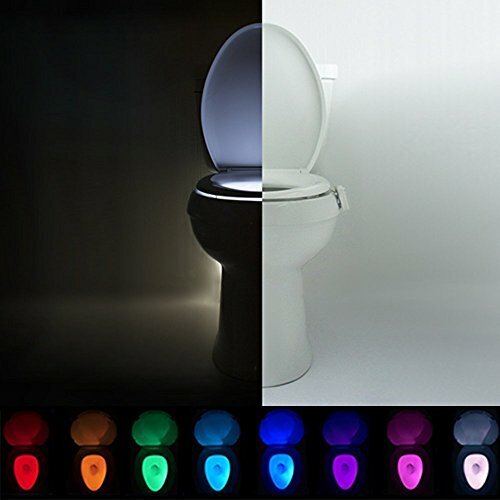 Add functionality to your bathroom lighting with this useful and attractive toilet night light. No more blinding midnight lights, stumbling around or trying to aim in the dark causing an unpleasant mess. Illumibowl is also an ideal tool for potty training. The motion sensor light will allow kids to confidently find the potty at night, and the colorful “glowing water” will make it fun to look at and sit on. Illumibowl brings you the convenience when and where you need it most. Shop with confidence; every Illumibowl comes with a Lifetime Seller Guarantee. Toilet night light: Illumibowl will illuminate the inner bowl of the toilet and provide a soft glow any time you walk into your bathroom in the dark. Satisfaction 100% guaranteed. Motion-activated: Features a motion sensor and built-in light detector that turn itself on and off. This innovative toilet night light only works in the dark allowing for efficient battery use. Adjust color & brightness: 9 different color settings. Set to your favorite color (8 single colors) or color-cycle with the touch of a button. Adjust the brightness using the 3-stage dimmer. Perfect fit: The strong hold design allows you to custom fit the flexible never-fall arm to any toilet. No need for tools or adapters, just hook over the rim of the toilet bowl and you are all set. Functional & Convenient: No more blinding midnight lights, stumbling around or trying to aim in the dark causing an unpleasant mess. The Illumibowl is also an ideal tool for potty training. If you have any questions about this product by IllumiBowl, contact us by completing and submitting the form below. If you are looking for a specif part number, please include it with your message.